From the deBeer Europa collection, this fine Italian Calfskin watch strap has a beautiful Lizard Grain embossing, which provides the elegant look of authentic Teju Lizard, without the expense. Soft, nubuck lining provides comfort and water resistance. Light padding. Semi-Shiny Finish. Length = 6.75" e-mail for if you have a choice for the buckle color choice - reference your order number. 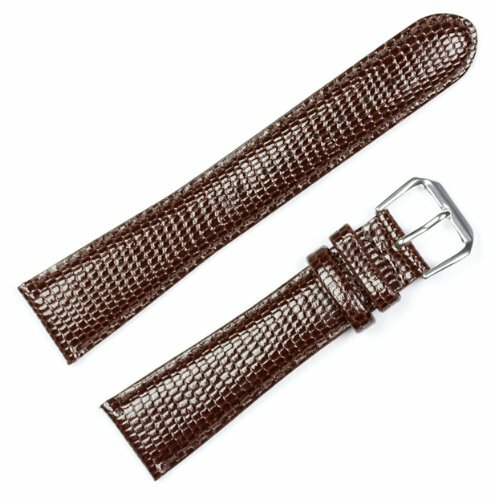 NOTE: The width of the watchband in the picture shown may be wider or narrower than the size you are actually ordering. We use this size picture of the band to show the detail of the skin. From the deBeer Europa collection. If you have any questions about this product by deBeer Watch Bands, contact us by completing and submitting the form below. If you are looking for a specif part number, please include it with your message.